Every now and then, a breakthrough comes along changing the way we express ourselves. Not simple improvements upon existing technology, but radical changes giving us new options to express our creative visions. Introducing the all-new Epson Stylus® Pro 4800. 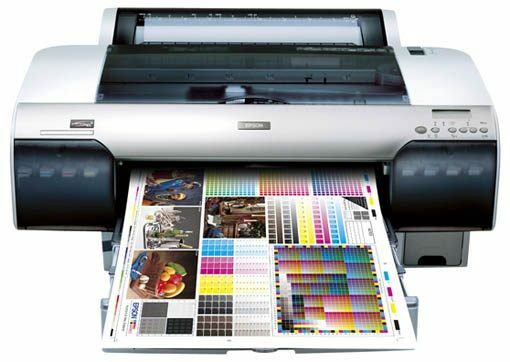 Designed to meet the needs of the most demanding professionals, the Epson Stylus Pro 4800 incorporates a unique 17-inch wide printer design with a breakthrough new 8-color ink technology, forcing us to reconsider what's possible from photographic ink jet printing. Epson UltraChrome K3™ ink technology represents a turning-point in the history of ink jet printing. Inspired by our past-generations of pigmented ink development, Epson UltraChrome K3 incorporates a new three-level black, along with eight new color pigments dramatically raising the bar for professional color and black and white prints.